The Convocations of a College are held in a suitable Temple which must be furnished with an Altar, Superaltar and Cross, and thirty-three candles; there must also be four pillars for the Ancients, and due accommodation for the Officers and Members. 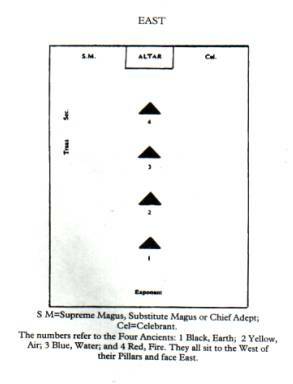 The positions of the Officers are shown in the two plans included in this ritual. Celebrant: Fratres of the Rose and Cross assist me to form the Mystic Circle. The fratres rise and form the Mystic Circle clasping each other’s hands. Celebrant: Very Worthy Exponent, what are the objects of our assembly? Exponent: The diffusion of Light and the advancement of Science. Celebrant: How do we hope to accomplish the aims we have in view? Exponent: By prayer and perseverance in the paths of knowledge and virtue. Celebrant: Before we bend the knee to Heaven, Very Worthy Exponent, let us assure ourselves that the Fratres are in possession of the Mystic Word. Exponent: Fratres, I pass the Mystic Word by letters to the East, I N R I.
Celebrant: The Mystic Word being correct, I return it to the West, I N R I.
Celebrant: Fratres, let us pray. The Fratres all kneel, with their hands joined. Celebrant or Chaplain: Fountain of Light and Glory of the Universe, we humbly adore Thee. Here all bow Bless the Union of our hearts, symbolized by the joining of our hands, and illuminate our spirits with the brightuess of Thy perfection. Sanctify our desires and purify our thoughts, so that we may become worthy to commune with the Holy Ones whom Thou hast created; and finally grant us an everlasting inheritance in the dominions illuminated by the rays of wisdom from Thine unapproachable Throne. All bow and say Amen. All then rise and resume their former position. Celebrant: In the name of I N R I I declare this Temple duly opened, the Mystic Circle of Fratres of the Rose and Cross duly formed, and the Chain of Union complete. All clap with their right upon their left hand. The Celebrant takes the Chair in the South East, the Exponent in the West, and all the Fratres return to their seats. The Secretary meets the Aspirant in the Anteroom and hands to him two copies of the Pledge of Fidelity. The Aspirant must read and sign them, and must add a Latin Motto (not one which has already been chosen by a Frater of the College), by which he may be known as a Frater Rose Cross. The Secretary must witness the signature. The Acolyte blindfolds the Aspirant and instructs him to give one knock on the portal of the Temple. Guardian: Right (or Very) Worthy Celebrant there is an alarm. Celebrant: You will ascertain the cause. Guardian, after ascertaining: Right (or Very) Worthy Celebrant, Brother ... a qualified Master Mason who has duly read and signed the Pledge of Fidelity, now seeks to be received as a Member of this College in order to study the doctrines taught by the Society of the Rose and Cross. Celebrant: Let him be admitted and received by the Conductor. Conductor: I will go unto the Altar of God, even unto God who giveth joy to my youth. The Conductor leads the Aspirant to the West of the Temple. Celebrant: What is your desire? Conductor, I desire to go out of darkness into the pure light of knowledge, to learn the doctrines of Nature and to discover the wondrous principles by which the Universe is governed. Celebrant: My Brother, your desires are most laudable, but we are mortals like yourself; why come to us? Conductor: Because I believe that among you are practised many great virtues, and that the growth of ages has added to your stores of learning. I desire to be received into the Society of the Rose and Cross. Celebrant: My Brother, of your sincerity we are assured but of your zeal I demand some proofs. Conductor: I am ignorant of God, of Nature, and of myself. I am surrounded with spiritual doubt and darkness. I claim — I command to be received. Celebrant: You have spoken truly; a bold heart may command anything, and faith can remove the mountains of ignorance and vice. Prepare therefore to undergo the Elemental Proofs required by the laws of our Society. Celebrant: Let the Aspirant be conducted to the Gate of Life, where the Four Ancients will unfold to him by the Elemental Proofs the primary secrets of Nature and Truth. If there is more than one candidate, they must all participate in the Proofs, the Ancients taking the hands of all the Aspirants, and speaking their parts once only, addressed to all, and applying the tests to each Aspirant in turn. The Conductor leads the Aspirant around the Temple and places him at the left hand of the First Ancient, who rises, and taking the right hand of the Aspirant in his own left hand, places earth upon his palm, saying: The First Ancient said, Harken, O Aspirant, Death is the gate of life; fear not to enter therein, for in dust are sown the seeds of immortality; and the Word is Immortal. The Conductor leads the Aspirant again around the Temple, and places him at the left hand of the Third Ancient, who rises, and, taking the right hand of the Aspirant in his left hand, applies the test of water by dipping his right forefinger in the water and making a cross on the forehead, saying: And the Third Ancient said, Let us approach with joy the House of Sanctification with clean hands and purified hearts, for our strength is in the Most High God; and the Word is Strengthness. The Conductor leads the Aspirant again around the Temple, and places him at the left hand of the Fourth Ancient, who rises, and, taking the right hand of the Aspirant in his left hand, applies a fire near enough to allow it to be felt, saying: And the Fourth Ancient said, Let us therefore enter the Temple of Perfection, and shrink not from the ordeal of virtue, for the wrath of God consumeth only the impious and impenitent man. The Word is Virtue and the four words make the sentence Immortal Hope Strengthens Virtue. The Aspirant is again conducted to the West. An anthem or voluntary may now be performed. Celebrant: My Brother, the trials through which you have successfully passed were ordained to test your patience and perseverance. In ancient times the knowledge of the Most High was not revealed without due preparation on the part of the Aspirant for the sacred mysteries. His initiation was preceded by four purifications, viz by earth, air, water and fire as well as by signal proofs of his morality, prudence and zeal. Having submitted with cheerfulness to the required tests, are you likewise willing to assure us of your good faith by a pledge of fidelity, vows not being exacted from the members of this Grade? Celebrant: Do you therefore pledge your honour as a Master Mason never to reveal the secret Ceremonial of the Mystic Circle, except in strict conformity with our Ordinances? Celebrant: Do you promise to prosecute with zeal the study of our mysteries, to yield a ready obedience to your superiors in the Society, and to assist and defend your Fratres of the Rose and Cross when occasion requires it? Celebrant: Fratres, are you satisfied with the answers given by the Aspirant? The Fratres all clap their hands as a sign of assent. Celebrant: Conduct the Aspirant to the foot of the Altar. This is done, to a kneeling stool there placed. The Torch Bearer with lighted censer precedes the Aspirant. The censer is placed immediately in front of the Altar, in as central a position as possible, and the Torchbearer resumes his seat. Celebrant: As true Rosicrucians we respect the decrees of the Most High and bend the knee to Him from Whom we derive our existence. Let us therefore kneel and pray. Conductor assists the Aspirant to kneel before the Altar. All Kneel. Celebrant or Chaplain: We supplicate Thine eternal and most just goodness, O Holy Lord, Father Almighty, Author of Light and Truth, on behalf of this Thy servant, that Thou wouldst vouchsafe to illumine him with the Light of Thy wisdom; cleanse him and sanctify him; give unto him true knowledge, that being made worthy of the grace of Thy baptism, he may retain firm hope, right counsel and holy doctrine. All the Fratres answer Amen. The Exponent reads the first five verses of the first chapter of the Gospel according to St John: In the beginning was the Word, and the Word was with God, and the Word was God. Celebrant: Rise my Brother, and receive the light of our Mystic Temple. The Conductor raises the Aspirant from the kneeling stool and removes the blindfold, at which moment all the Fratres clap their hands. Celebrant: The Lord’s Light be with you. Exponent: And with thy spirit. The Celebrant stands beside the Aspirant, facing East. Celebrant: Worthy Brother, on being restored to vision you stand before the Altar which we raise to commemorate the spotless life of Him who was the manifested glory of I H V H. Above the Altar are inscribed the initials of that Sacred Name and Title which were traced in burning letters upon the Cross of the Redeemer. Treasure in your heart, my beloved Brother, the remembrance of the Word I N R I. Forget not that for thirty-three years He laboured on earth in meekness and humility, a period represented by the thirty-three lights on the Altar. The Roses allude to the beauty and grandeur of His Resurrection from the dead, and are typical of the eternal glory of the Rose of Sharon. The Five-pointed Star reminds us of the five points of felicity, which are to walk with, to intercede for, to assist, to love, and to pray for our Brethren, so as to be united with them in heart and mind. The incense, which rises towards the luminous Star, is a symbol of prayer which proceeds directly to the Throne of God. Learn to fullfil the Law, for it is pleasant, and all its paths are peace. All except Celebrant, First & Fourth Ancients, Conductor and candidate silently form the Mystic Circle. The Conductor hands a white robe to the Celebrant, who then invests the Aspirant with it, the Exponent reciting: He that overcometh, the same shall be clothed in white raiment (Rev iii, 5). Celebrant: Receive this white garment, and see thou carry it without stain before the tribunal of the world, of your Fratres and of our Master, for so thou mayest have eternal life. The First & Fourth Ancients step up and stand behind the Aspirant, and, with the Celebrant, all three place their right hand on his head, and all three say: We receive thee as a Frater of the Society of the Rose and Cross. Ancients take their places in the Mystic Circle. Celebrant: You will now be placed in the Mystic Circle, and will join with us in repeating the initials of the Mystic Word. The Aspirant is placed in the Mystic Circle by the Conductor, immediately on the right of the Celebrant. The Celebrant passes the Mystic Word to the West, and the Exponent returns it to the East. Celebrant: The Mystic Word is correct. I declare the Mystic Circle to be perfect, and the Chain of Union complete. All clap hands once and return to their places. Music, anthem, voluntary or choral singing. All resume their seats. Celebrant: You will now be conducted to the outer chamber to enable you to reflect upon the solemn ceremony through which you have just passed. Let me, therefore, strictly enjoin you to a deportment consistent with the honour and dignity of this Society of the Rose and Cross into whose circle you have been this day received, a day which should be ever considered as one of the most memorable periods of your life, inasmuch as you have voluntarily dedicated your soul to the service of Truth and Virtue. The initials forming the Mystic Word, with which you have been entrusted, will ensure your readmission to the Mystic Circle. The Celebrant hands to the Aspirant a Mystic Token; the Conductor then leads the Aspirant out of the Temple. In the Anteroom the Aspirant, instructed by the Acolyte, writes the initials of his Latin Motto upon the M... T..., and awaits in a period of contemplation the order for his readmission. 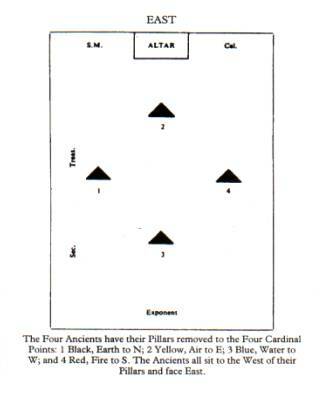 In the Temple the seats of the Four Ancients are removed to the four cardinal points of the Hall — that is, to the middle of the four sides as shown in the second plan — the Black Pillar to the North, the Yellow to the East, the Blue to the West, and the Red to the South. All the lights upon the Altar are extinguished except three: the highest candle and the two outside at the base of the Superaltar, thus forming a triangle of Lights. When all is prepared the Guardian informs the Acolyte, who instructs the Aspirant to carry the M... T..., and to knock three times on the Portal. Guardian: Right (or Very) Worthy Celebrant, there is an alarm. Celebrant: You will ascertain the cause. Guardian: A Frater who has been chosen seeks readmission. Celebrant: Frater Conductor, you will receive our Brother, and if you find that the Mystic Token is signed in due form, you will admit him. The Guardian admits ihe Aspirant, who is received by the Conductor. The M... T... is examined, and, if it is approved, he leads the Aspirant to the West of the Temple. Conductor: The Aspirant brings with him the Mystic Token duly signed; he has meditated upon the precepts of the Society and craves to be permitted to make further progress. Celebrant: What does he now desire? Celebrant: You will lead the Aspirant to the centre of our Temple by the seven steps of Wisdom. This is done by the Conductor, who then instructs the Aspirant to stand erect, facing the Altar with his arms fully extended. Celebrant: Worthy Brother, whence come you? Conductor, for the Aspirant: I come from a land of shadows, where the rays of Wisdom do but rarely penetrate. Celebrant: Where do you now stand? Conductor: In the symbolic centre of the Universe; my arms are extended from North to South; my desire is to approach the radiant East and to rejoice in the Light of Perfection. Celebrant: You are worthily inspired, my Frater; I approve and commend your zeal, but your progress to the goal of truth must be slow and gradual, as the mysteries of nature are not to be unfolded to all who seek her shrine, but only to the strong in faith and the humble in spirit. Behold me therefore approaching you from the radiant East to communicate those secrets which have long been cherished by the Fratres of our Society. Celebrant (or Magus): The Sign of a Zelator of the Society of the Rose and Cross is thus given: raise both the hands to theforehead, palms forward, and then cross the forefingers. The Pass Word is Lux which signifies Light. The figure of a cross is equivalent to the word Lux as it exhibits the letters of which that Word is composed. On the continent of Europe the Pass Word was not spoken, but was given by the fingers thus making L, V, X with fingers. The Pass Word leads to the Grand Word composed of the Four Mystic Letters I N R I which represent the Everlasting Son, Who is the true Light of the World and the Glory of the Father. To obtain admission to the temple, a Zelator must give Three and Two knocks on the Portal. The number Three refers to The Trinity, and the number Two to the ancient Hermetic maxim ‘As above, so it is below’. You will now take your seat while the Exponent reads a portion of the Revelation of St John the Divine. The Exponent reads Rev vii, 9 to 12. Exponent: After this I beheld, and, lo, a great multitude which no man could number, of all nations, and kindreds and people, and tongues, stood before the throne, and before the Lamb, clothed with white robes, and palms in their hands; And cried out with a loud voice, saying, Salvation to our God which sitteth upon the throne, and Unto the Lamb. And all the angels stood round about the throne, and about the elders and the four beasts, and fell before the throne on their faces, and worshipped God. Saying, Amen: Blessing, and glory, and wisdom, and thanksgiving, and honour, and power and might, be unto our God for ever and ever. Amen. The following Address is then delivered by the Celebrant, or by a Frater chosen by him. Frater, having passed through the various trials required by our Ordinances and having knelt before the Altar of Light, you are now permitted to join in the mystic labours of the Society. This privilege is conferred only upon discreet and worthy men, to whom the revelation of Theosophy and Hermetic Science may be safely confided. In the ceremony through which you have been voluntarily conducted this evening, you will doubtless have observed a similarity to certain rites practised in the Ancient Mysteries. It is thus that we hope to lead the sincere Aspirant to the radiant realms of intellectual Truth, and to the Court of the Everlasting I H V H.
The significance of our symbols is a most important branch of the studies which you have promised to prosecute with zeal. This engagement which your tongue pronounced and, we trust, your heart approved, can be fulfilled only by diligence and perseverance. We trace the growth of our philosophy in the perpetual advent of Sages through the remotest avenues of Time, a grand and spiritual procession of Teachers illuminating the earth with their wisdom. All the great and wise men of old have kindled their lamps at the Sacred Fire in which we now rejoice. Among the secrets of Nature, which it is now your duty to investigate, are the mysteries of the Kabalists, which include the demonstration of the Eternal Essence of God, the key to the government of the Universe and the powers and properties of Numbers. With reference to the interpretation of Numerals, I may briefly explain the primary meaning attributed to each. No. 1 represents God, the Unity of the Divine Being, and the generative principle of Nature; it is typified by the central point within a circle. No. 2 is called the Dyad; it denotes the active and passive qualities of Nature, male and female, Light and Darkness, Life and Death. No. 3 is called the Majestic number, as it refers to the Trinity, the Triple Essence of the Deity; its emblem is the equilateral triangle, which in ancient Egypt was called the Sacred Delta; it was symbolical of Osiris, Isis and Horns, and the Hierophant in the mysteries of Osiris required all Candidates to take the oath of secrecy with both hands extended over this Divine Symbol. Brahma, Vishnu and Siva form the Trinity of the Hindoos. No. 4 is the Mystic number, and indicates the operative influence of the four elements. Under this number, or the geometrical square, Pythagoras communicated the ineffable Name of God to his chosen disciples. No. 5 is the emblem of Health and Safety; it is also denominated the Occult number; the Pentagram was a famous talisman; it represents Spirit and the four Elements. In our Society the Pentagram should always appear pointing upwards, the downpointing Pentagram being an emblem of ill omen. No. 6 is considered an epitome of Nature, as it presents to our view the dimensions of all things, adding to the four cardinal or superficial points, the two lines of height and breadth; the Hexagram representing the Planets was also a notable talisman. No. 7 is the Perfect number, also termed the most venerable, since it refers to the creation of the world according to the Mosaic cosmogony. No. 8 designates the primitive law of Nature, being the first cube, and points out that all men are born equal; it is also esteemed the number most to be desired, being the number of Justice. No. 9 is called the Triple Ternary and refers to the perfection of the spheres. It is the first square of an odd number. No. 10 is the most sublime, as it contains the Monad or Unity which created all things, and also the Zero, a symbol of Chaos, out of which the world was formed. It is the foundation of the Divine Sephiroth of the Theosophical Kabalab of the Hebrews. No. 11 is called the Evil number; it is an omen of Defeat or Death. No. 12 alludes to the 12 Apostles of the Messiah, and to the 12 signs of the Zodiac, expressing the cosmogony of Nature, spiritually and materially. The square of 12 — namely 144 — is the limit of each Rosicrucian circle, and reminds us of the 72 attributes of God, which form the names of the 72 angels who occupy the 72 rounds of the ladder of Jacob, which is said mystically to reach from earth to heaven. The Aspirant is again conducted to the centre of the Temple. An Anthem may now be sung. The newly-admitted Frater is placed before the Altar, and the Fratres resume their seats. The Torch Bearer proceeds to the newly-admitted Frater and places a lighted taper in his hand. The M... T... is burnt by the Torch Bearer, who says: As the light of this taper, so shall your light be extinguished from among us if you fail. Celebrant: I now exhibit to you and shall shortly invest you with the Jewel of the Society. It consists of a cross, the arms of equal length, on a curved shield having the form of a lozenge or rhombus. The arms of the Cross exhibit four times 18, that is 72, lines, having reference to the 72 rounds of the Ladder of Jacob; in the centre is a square, representing the Square of the Universe; and in the midst of the square is a Pentagram, that mysterious device which has always been considered by ancients and moderns as a potent emblem. The Cross is overlaid with Red enamel, surrounded by a Golden line; while the shield is of White enamel with a girding line of Gold. The jewel is suspended by a Green ribbon from a Golden bar on which are inscribed the letters S R I A. I now invest you with the Jewel. I exhibit to you the Warrant under which the Convocations of this College are held. I present to you a copy of the Ordinances of the Society, and a copy of the By-laws of the College. I congratulate you upon your reception as a Zelator and express the hope that you will in due course gain such knowledge of our mysteries as will merit your advancement to a higher grade. You may now take a seat in the Temple among your Fratres. Celebrant: Very Worthy Exponent, having satisfactorily laboured to diffuse the Light, what is our reward? Exponent: The consciousness of having performed our duty to God and man, and more particularly to our Fratres of the Rose and Cross. Celebrant: With this guerdon let us be content. Aid me to dissolve the Mystic Circle and hermetically to seal up our secrets in the chambers of our souls. All rise and form the M... C... as in the Opening. The Fratres kneel as in the Opening. Celebrant or Chaplain: In the Light of Thy countenance, O Father of angels and men, we rejoice and are glad. All bow May we leave Thy footstool with purer hearts and clearer consciences, and may we be spared to assemble again in this Temple of Truth. Hasten, we beseech Thee, the coming of that day when Thy knowledge shall cover the earth, and the ftdlness of Thy glory be revealed to all mankind. All bow twice, and say Amen. All rise and resume their Jormer positions. Celebrant: By the Mystic Word I N R I I dissolve this Mystic Circle and declare the Chain of Union imperfect until again united by the power of the Mystic Word. All break off and clap hands. Celebrant: The temple is closed. do solemnly and sincerely declare that I am a Master Mason holding the Certificate of a regularly constituted Grand Lodge of Ancient, Free and Accepted Masons, and that I seek admission to the Rosicrucian Society, and that if admitted to membership, I will duly conform to the Regulations of the Society and will obey the By-Laws of the College.